Trampoline batteries are more and more popular in the entertainment business and in all facilities that host events for children. This attractive equipment will be the ideal solution for a long term investment that will appeal to a wide audience. For the installation of your battery, France Trampoline highly recommends the Aero range, which offers big and robust trampolines, ideal for intensive use. These trampolines are fitted with galvanized steel structures and can receive up to 10 jumping pads per battery. Looking for a single trampoline for your establishment ? Our Pro One trampoline, available in 2 sizes, is identical to the trampoline structure used for our Aero trampoline batteries. The robust rectangular structure will guarantee the professional usage of this trampoline. 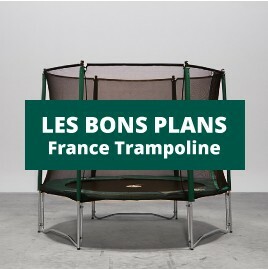 Choose a France Trampoline battery, a pleasant and sporty attraction appreciated by all ! All the materials used have been selected for their robustness and reliability : The jumping pads are manufactured with polypropylene mesh or a technical fabric coated in PVC, the springs and the structure are made using hot-dip galvanized steel, the most efficient anti-corrosion treatment for equipment that can remain outside all year round. All of the trampolines are separated by thick polyester frame pads (60 mm), which will perfectly break any jumps outside of the jumping mat area. These frame pads are available in several colours (blue, green, yellow, red and orange). To ensure full safety for users, a safety enclosure is set up all around the battery. Our trampoline batteries meet EU standards EN 13219 and EN 913 regarding the design, manufacturing and the test methods used. Trampolines for professionalsThere are 13 products.